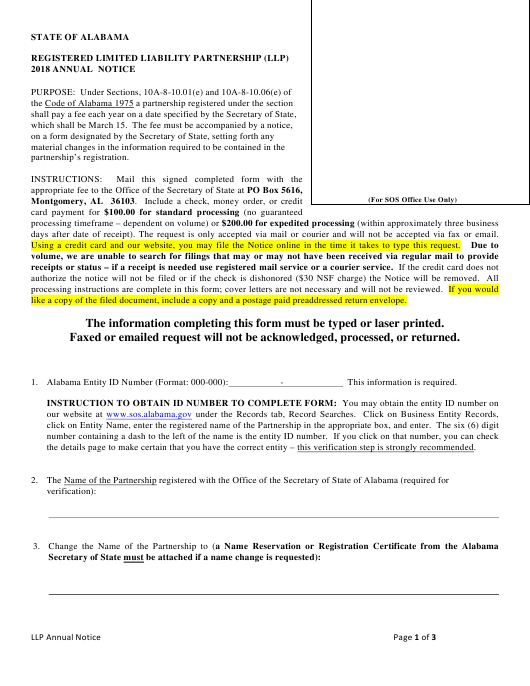 This Alabama-specific printable "Registered Limited Liability Partnership (Llp) Annual Notice" is a part of the legal paperwork issued by the Alabama Secretary of State. Download the up-to-date PDF by clicking the link below and mail it as per the guidelines provided by the department. days after date of receipt). The request is only accepted via mail or courier and will not be accepted via fax or email. Using a credit card and our website, you may file the Notice online in the time it takes to type this request. like a copy of the filed document, include a copy and a postage paid preaddressed return envelope. The information completing this form must be typed or laser printed. Faxed or emailed request will not be acknowledged, processed, or returned. the details page to make certain that you have the correct entity – this verification step is strongly recommended. Information completed in the following items will be used to change the data on the index. of the filing fee but no convenience fees. MUST be typed or laser printed on a computer. fees (i.e., $200 if you are requesting expedited service) to the Alabama Secretary of State.